Small shops or “dukas” account for 80 percent of employment in Africa and sell over $180 billion worth of goods every year. In Kenya, 95 percent of the population frequent dukas where 70 to 80 percent of fast-moving goods are sold. Despite their importance, these businesses have limited operational capacity or prospects for growth. The shopkeepers lack business management skills, and have limited access to finance and working capital, making them vulnerable to shocks and stunting their growth. However, it is important to recognize that shops are very dynamic in nature. These businesses are constantly in flux; starting, growing, failing, and starting again. 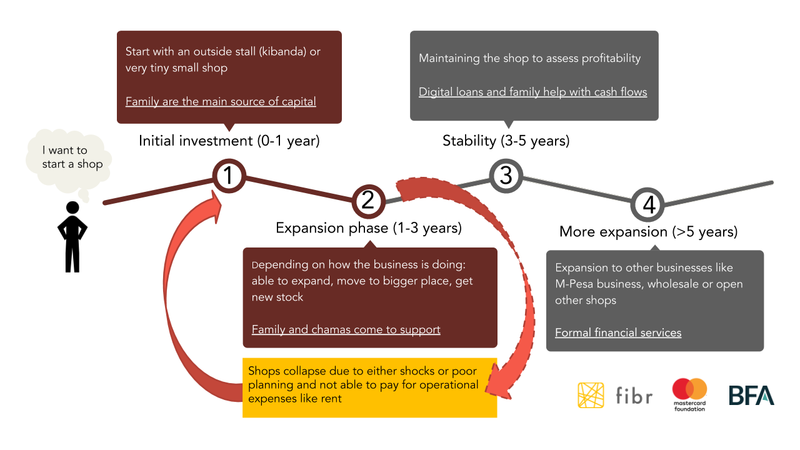 At FIBR, we have observed from our research examining the financial ecosystem of merchants, that these small shops follow a pattern — they have a life cycle. These micro, small & medium enterprises (MSMEs) go through predictable stages that financial services providers (FSPs) should learn to recognize when offering services. In particular, when it comes to digitizing the business, it should only be implemented in the more mature shops. There are four key stages in the life cycle of a small shop; each with its own characteristics and needs, especially when it comes to financing. Most of the merchants we interviewed started their shops with an initial investment of US$200-$350. This investment is usually a gift from someone in their family, husbands or siblings, or comes from savings if they held a job before. The business is usually either a very small shop or an outside stall. This initial investment period usually lasts a year or less, and the shop features a very limited variety of stock. In some instances, the shops will start off with goods that sell quickly like milk and bread and as they generate income, the merchants will increase the range of products. During this phase, the merchants also start building relationships with both customers and suppliers. At this stage, the financial needs of the business are small as the merchant is still trying to understand the business’ viability. Financially, the initial investment is not usually repaid in cash but through fulfilling social obligations (e.g., if the sibling who gave the investment falls ill, the merchant helps him/her financially). This may not be an appropriate stage for FSPs to offer services to the merchant, as she is still learning the ropes and the financial needs are minimal. After severals months to a few years, the merchant begins to expand the business in earnest. By this time she has been able to build relationships with customers and suppliers, and feels the demand for goods is increasing. During this expansion phase, we found merchants tend to use informal sources of credit (e.g., family, savings groups) to purchase more stock or to move to a bigger locale. Again, the merchant needs about $200-$350 to undertake the expansion. This expansion phase is critical to the long-term viability of the business. If the business expands successfully, it will enter a stabilization phase. However, if the business hits a roadblock, it may not recover. Growing too fast, taking on too many expenses, or a personal shock such as a health emergency or death in the family can result in the business collapsing during this stage. During this period, merchants need insurance to manage shocks as well as business insights to make good business decisions. For example, robust supplier relationships and smart decisions about location are crucial. Shopkeepers who negotiate good prices, and contracts with suppliers and locale owners are better positioned for success. 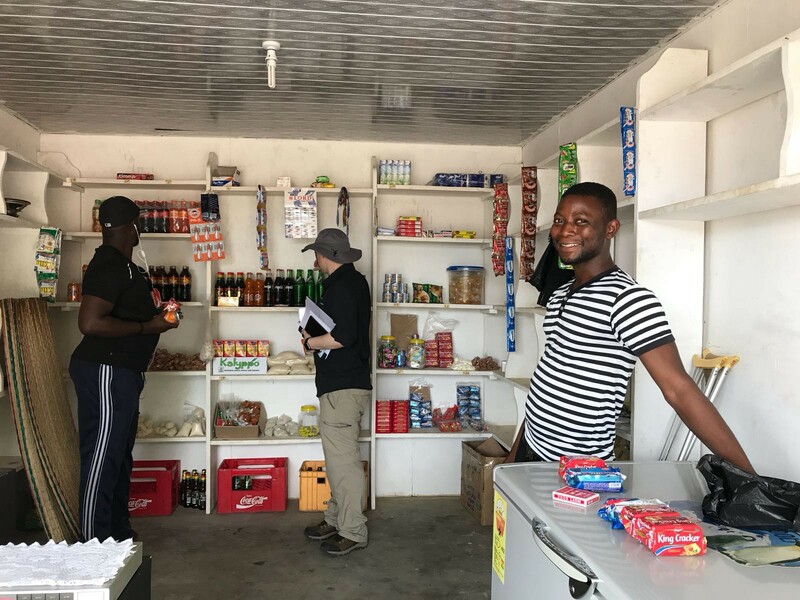 FSPs could better serve the merchants during this period by offering skills training bundled with insurance products to help them recover from shocks and make better choices in running their businesses. Those that survive the expansion phase enter a stabilization phase, during which the merchant maintains the shop while making small improvements to increase profitability. This phase usually lasts three to five years. During this phase, the merchants struggle with cash flow and use digital loans or family and friends to meet shortfalls. Some merchants may be comfortable in this phase and may choose not to expand their business further. They are happy to have a consistent source of credit of $100-$200 to help them with cash flow challenges and to manage inventory. From the perspective of the FSP, merchants at this stage are low-risk clients. They have a consistent income but they need loans for cash flow. By offering credit to suppliers, suppliers could pass down the credit to merchants — for example, with short-term in-kind credit to stock up inventory — and collect repayment the next day or several days later. At this stage, the merchant should be able to start digitizing the business ledger especially if the merchant wants to expand the business. This phase typically takes place after the fifth year as merchants expand to another line of business, such as opening an M-Pesa business, going into wholesale, or opening another retail shop in a different area. To enable this expansion, most merchants borrow from formal financial institutions like banks, SACCOs or MFIs as the amounts they need are too large to source from their families. On average, merchants borrow between $1,500-$2,000 to help with this expansion. At this point, the merchants will start to really invest in the business, keeping better records and taking on employees. At this stage, digitization also becomes necessary. While FSPs might be excited to have merchants start digitizing records from the beginning, we have found that merchants are only ready to invest in digitization during a secondary expansion, once they see the need to keep proper records. In the early stage, the merchant’s priority is surviving the first few years of the shop’s life cycle. Among other competing needs, getting the merchant to digitize the business transactions is a big ask. These entrepreneurs also fit various profiles based on their goals for their businesses. FSPs should go one step further in identifying the type of entrepreneurs within each of these stages. There are some entrepreneurs who are willing to grow their business and some who want them to remain manageable and small. In an upcoming blog, we delve deeper into these different types of merchants to help FSPs recognize the needs and potential of each. Learn more about our ongoing MSME research by signing up for our “Hitting the Sweet Spot: What do small merchants need to survive and grow their business?” webinar and follow us on Twitter @FIBR_BFA. FIBR stands for Financial Inclusion on Business Runways and aims to learn how to transform emerging business data about low-income individuals and link them to inclusive financial services to deepen financial inclusion and its impact. FIBR is a project of BFA in partnership with Mastercard Foundation. Stay connected by signing up for the FIBR mailing list and joining the Inclusive Fintech Group on LinkedIn. BFA specializes in using finance to create solutions for low-income people around the world. We bring deep expertise in customer insights, business strategy, inclusive fintech, policy and ecosystem development to enable the next billions to strive for better lives.